Mongla Port Authority job Circular 2019. Bangladesh Mongla Sea Port Authority Published a Latest And Attractive Government job circular on Thaire Official Website www.mpa.gov.bd. Total Mongla Port Authority job Circular 2019-www.mpa.gov.bd-47 post. Organization/Institution Name: Mongla Port Authority (MPA). 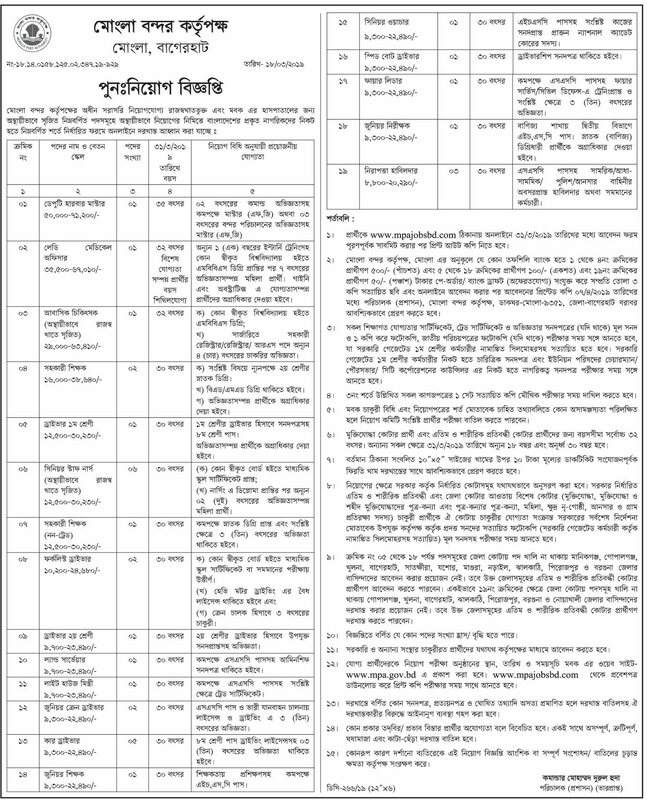 Jobs Area: Bagerhat, Khulna Division. Job Catagory: Bangladesh Government job circular. Salary: 8800 to 72200 Taka. bd Job Position: See The MPA Job circular 2019. Age Limitation: Follow the www.mpa.gov.bd job Original Notice. Online Application Start DDate: See bd Hot Jobs circular below. Employee Application Fee: 50 – 500 Taka.